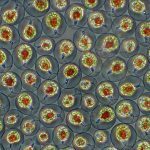 Home / Aquaculture / Microalgae, Why Grow It? Microalgae. We have all heard of the microscopic organisms that use light to grow. But why should we raise it? In the ocean, microalgae is at the bottom of the food chain. The plankton feed of it, get energy, and give that energy to the fish and crustaceans that eat them. 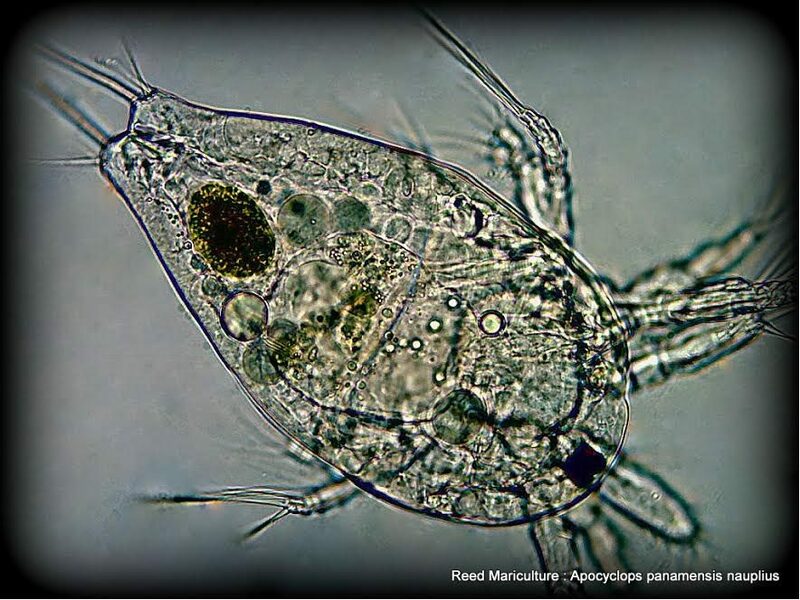 Without a stock of microalgae, there could be no zooplankton growing in our tanks, like amphipods or copepods. A healthy captive reef system has a supply of these in their tanks, whether it was added manually, or they came in as a “hitch-hiker” off of a rock or sand. For myself, I have been using them to raise various species of zooplankton, mostly copepods. 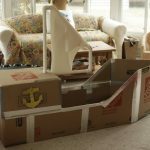 At age fifteen, I was learning everything I could about marine biology and the hobbyist community. Eventually, I found my way to the Marine Breeding Initiative (MBI), where I found that it was possible to breed fish and have living plankton outside of the tanks! This idea enthralled me, and I started right away getting as much information I could find. The most common species of algae that they, the MBI, kept were T-Isochrysis galbana, Tetraselmis chuii, and Nannochloropsis. Essentially a brown microalgae, followed by a green and a yellow-green algae. I found that in order of difficulty and care, the Nannochloropsis and Tetraselmis tended to be the easiest, in the beginning. Before raising algae though, you must understand that microalgae does not enjoy contaminates. At all. 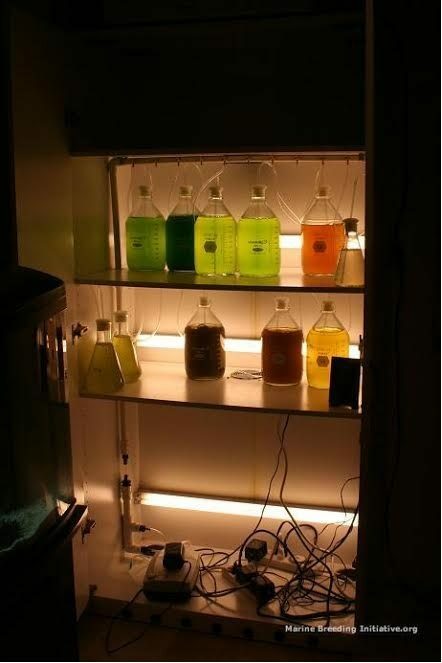 Most people will make a fresh batch of saltwater before they put their algae into a container. When I was raising them, I took it a step further. I would take my mason jars, fill them with the fresh saltwater, or as I found later, with this method I could even use old saltwater if I strained the water through a 5 micron mesh, added a few drops of Florida Aqua Farms’ MicroAlgae Grow product (what my algae eats) and put it into the microwave until the temperature hit a solid 185 degrees Fahrenheit. This temperature kills all of the organisms in the water, so the only thing left in the container is food for your algae. With this method, I was able to keep a culture of T-Iso, the ‘hard to keep’ algae, for well over a year. Being limited on space, I created the “Algae Tower.” Essentially, this contraption was a small 2’x2’ wooden tower-like structure that went up about 6’, with levels every 1.5’. On each level, the sides had three Home Depot strip lights used for illuminating the algae, which I kept on for sixteen hours, and off for eight. The algae itself was kept in quart mason jars, with a loose plastic lid screwed on. These lids had a hole in them just big enough to allow me to fit a piece of airline tubing into it – as with most things that live on this earth, the algae needs a supply of carbon dioxide! Depending on the species of algae, they could only take so much of an air flow. For example, the T-Iso could only handle a flow of about 1-2 bubbles per second, while the Nanno needed quite a violent flow of air within it. After a few days, the mason jars that looked clear suddenly are full of life! The water has changed color to a solid yellow or green! From here, I had to do what is called “splitting” the algae, or removing most of it, and keeping a small amount to be used to restart the process. This has to occur every six to eight days, or else the algae will die and the culture itself will die. The leftover algae that was not used for the restart could be used for taking care of any copepods or rotifers you own, or just throwing it into the various fish tanks kept throughout the house. At this point, you are probably thinking: “Great Zach, you got passionate and learned about a few species of algae, and how to raise them. Why should I know?” Well, this knowledge can be used for a variety of things. I used this knowledge to feed a few populations of copepods that I kept in five-gallon buckets, and then used them to seed live food into my tanks. “Ah, live food!” Yes! Live food! 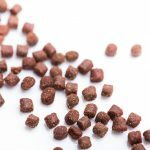 With these, you can now keep fish like mandarins, or any fish that does not eat frozen or flakes, without the hassle of needing to have the store owner wean the fish onto frozen food. This also means you don’t need to go out and buy copepod after copepod populations from various stores, you just need to buy it once. 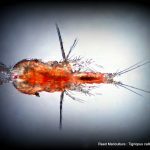 In another article I will talk about copepods, which species you can raise easily, and what they could be used for. Great topic Zach! I’ve discovered a way to genetically trick micro algae into resting like they do in winter. 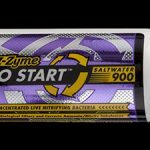 This is the perfect food for zooplankton and has a really long shelf life! I would like to send you some free samples for your evaluation! I would also like to discuss other potential feeding routes. Hit me up at Greg at Avarireeflabs dot com. Air China offers Hope to Sharks!